Love of expression comes home to roost. 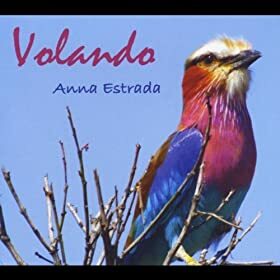 Bay Area jazz vocalist Anna Estrada may have a lot of irons in the fire, working as an anesthesiologist and an actress as well as dominating as a champion fencer, but her love of expression through song comes home to roost with the beautiful Volando. Performing with an impressive group that includes Jonathan Alford (piano, Rhodes), Alex Baum (bass), Ray Scott (guitar), Phil Thompson (drums), Tommy Kesecher (vibes, marimba), Charlie McCarthy (tenor saxophone, flute), and Al Bent (trombone) among others, Estrada’s searching understanding of the lyrics and how they suit the greater good of the song forms the heart of the record. That learning process, coupled with the sense of adventure Estrada delights in, leads to refreshing musical volatility. This gives Volando its true sense of flight: a well-ordered but winding sense of taking to the air, of singing without a net. This is evidenced profoundly with “Happiness is a Warm Gun/I Want You.” The Beatles medley discloses the intricacy of the Fab Four’s musical approach, but it also gives Estrada room to experiment. Her choices are fascinating, even eccentric, and she delivers a performance that is moving and raw as it bonds with Rich Kuhns’ accordion. Offsetting the somewhat off-putting vibe put forth by the aforementioned, Estrada and her group sink into the classic “Mais Que Nada,” complete with a sweltering percussion section pounding out a samba/reggae merger. Baum’s bass solo is a highlight. The Spanish translation of “Al Empezar el Beguin,” rendered once by Julio Iglesias, makes an appearance as well. For this piece, Estrada chose the rendition by Berkeley professor Coby Lubliner that she insists is closer in form to the Cole Porter original. The song draws out the warmer angles of her tone, allowing for a charming dance between the vocalist and Scott’s deft strumming. Volando finds Estrada in fine form, delivering a set of genuine songs in (at least) three languages. Her conversance with the lyrics and her ability to passionately express herself serve her well. And with more learning and adventure on the docket, there’s no telling where she’ll go from here.